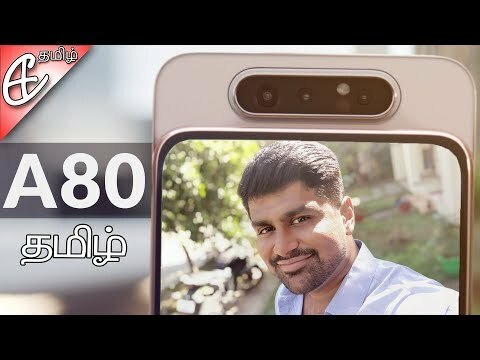 Samsung அவர்களின் புதிய Galaxy A80 Rotating triple cameras உடன் launch செய்திருக்கிறார்கள் . அதை பற்றி இந்த video-வில் காணலாம் . The Samsung Galaxy A80 features a full screen display as well as a revolutionary rotating triple camera setup that we have never seen before. We also have a 6.7 inch Full HD+ AMOLED display on the Galaxy A80 that is not interrupted by any sort of notch or punch holes. We also have an in-display fingerprint scanner here along with an in-display on-call speaker that makes use of the vibrating nature of our screen. Internally we have the Snapdragon 730G with 8 GB of RAM and 128 GB of internal storage. As far as optics go we have a 48MP primary camera, an 8MP ultra wide camera and finally a Time of Flight sensor. The three camera setup rotates into place pulling double duty as selfie cameras as well. We also have a 3700mAh battery with 25W Fast Charging. On the software part we have One UI that is based on Android 9 Pie.